Our Turn Key In- House Recon Systems help dealers sell more cars and increase revenue with a variety of profitable, do-it-yourself reconditioning commercial systems. Generate Extra Profit through your Sales, Parts, Service and Body Shop. Sell More Cars for More Money Faster than Before. Now with the Xpress Recon Sprayless Paint Chip and Scratch Repair Commercial System in-house, your service teams can perform lucrative reconditioning services professionally – within minutes. Until recently, the options for repairing vehicle scratches and stone chips have been limited, costly and time consuming. The most popular solutions for resolving paint chip and other cosmetic problems is either using traditional dealership touch-up paint (usually leaving unattractive dab marks on car) or outsourcing the repair to an external body shop. Both methods have liabilities. Xpress Recon Solutions now offers the highest quality, most economical solution for do-it-yourself sprayless paint chip and scratch repair. And, it takes just minutes! 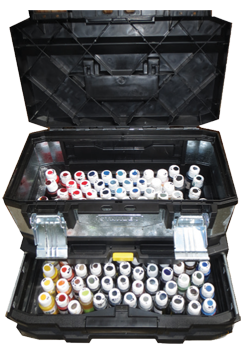 Using our portable, compact commercial sprayless paint chip repair kit, your dealership can perform professional superior repairs in your own service area for just pennies on the dollar. • Increase cash flow by selling a “dent and repair” service to customers. • Make the transition on the lot from a customer looking at a car… to signing the contract! • Create more satisfied customers will equal increased revenues. Increase Your Vehicle Profits and Customer Retention. Click on Video Below to Learn More. Because of the newest and most advanced evolving technology, your dealer can now safely and cost effectively sanitize and deodorize their inventory. Why would you want to deodorize and sanitize your car? We understand most consumers are ever increasingly worried about the hidden dangers of viruses, bacteria, and germs in not only the vehicles they drive but the vehicles that they buy. By making sure our vehicles are free of harmful viruses, bacteria, and germs you are offering our customers a piece of mind that we care about you and your family’s safety and well being. Beyond Clean Certification on my used car sounds like a good idea, but isn’t a detail enough? While most dealers will detail their inventory, there is a big difference between detailing and sanitizing. When a car is detailed they focus on vacuuming and wiping down the interior of the vehicle and cleaning the outside. This does nothing to get rid of the germs in the interior of the car. Studies have shown that after a car has been detailed it still has nine times more germs the a public toilet seat . While you will still have to detail your cars it is simply not enough anymore. Studies have also shown that the average used car can hold between 250-850 different strands of viruses, bacteria, and germs and the colder the climate the more germs are found in the vehicles interior. Beyond Clean Certified means no matter which car, truck or SUV you customers choose from your dealership, they will be left with a clean, germ free, and uniformly good smelling choice. It would be challenging to quantify exactly how many customers walk into your dealership and leave because a car they were interested in buying had a foul odor. Odors like cigarette smoke, pet dander or mildew can kill a car sale. By making sure your vehicles are free of harmful viruses, bacteria and germs, you offer your customers peace of mind. You also demonstrate that your dealership cares about them as well as their family’s safety and well-being. • The Spot Refresher – We walk around your lot and treat only the problem vehicles. • The Constant Clean Package – Xpress Recon DrivePur certifies all the vehicles on your lot, performing a weekly refresh of your entire inventory. 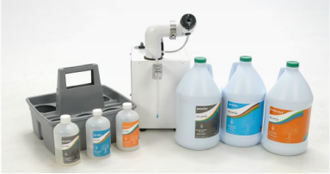 • Do-It-Yourself Profit Center – Purchase the equipment and chemicals, and you perform the services in house. We will provide training for you and your staff to become certified. For a product sample or demonstration, call us. We’ll gladly come to your site and provide a free sample. Ask your product specialist to assist you in choosing the one that best suits your customers. Diamondbrite Paint and Fabric: Guaranteed Protection For Your Customers’ Vehicles. Ongoing Profit For Your Dealership. The Proven and well- established Diamondbrite vehicle protection system enables you to drive extra profit through your Sales, Parts, Service and Body shop departments by offering a total peace of mind package to your customers. In the 30 years since Diamondbrite was launched we have helped thousands of dealers to improve margins, customer retention and presentation. We make it easy for you, too. Our local Business Development Managers work with you to maximize your profitability and customer satisfaction. We offer regular training to ensure each sales person to you dealership is highly motivated to sell Diamondbrite. With margins being constantly eroded, your Sales department needs a proven way to significantly boost profit. By introducing the clear benefits of Diamondbrite to your new and used customers, you can increase you profit buy up to $700.00 per vehicle. Dealers taking full advantage of the Diamondbrite support package are achieving regular sales penetration of 60% and above. Contact Us Now To Receive A Complimentary Cost Analysis Breakdown That Highlights the Benefits of Having an Xpress Reconditioning System Package In- House.